Poor guy. Poor us. It’s been a struggle since May. 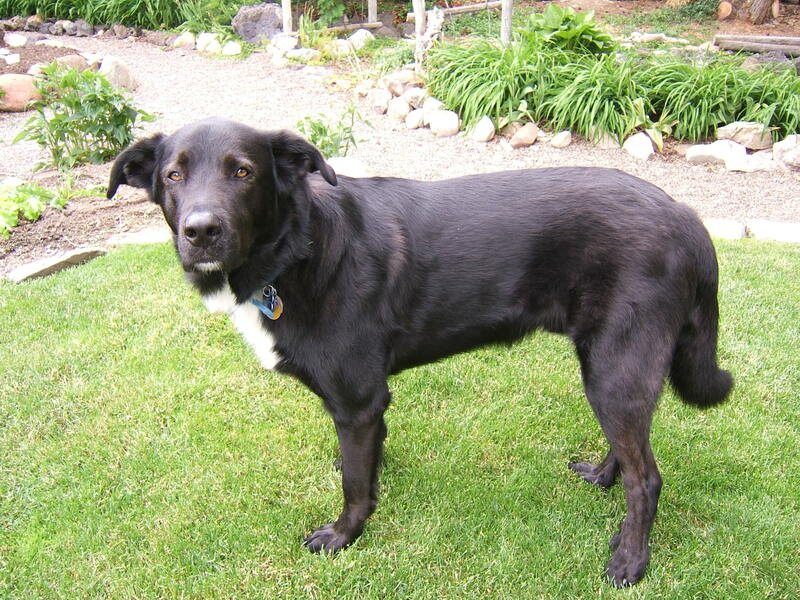 Dane is a big, black, mixed breed, Humane Society adoptee that we’ve had for (let me get the paperwork out to check) five and a half years now. He’s almost seven years old and weighs in at over a hundred pounds. He’s smart as a human toddler, playful as a puppy, imaginative (seriously…he pretends), loves children, kills small animals, is a mortal danger to cats, is cooperative and good natured, can’t get enough of people, and is constantly underfoot because he likes to be in on all the action (unless he’s sneaking tomatoes out in the garden at which point he becomes all but invisible). He’s also had more medical problems than any dog I’ve ever owned. We’ve dealt with everything from excessive drooling, incontinence, and hair loss to multiple accidents and epilepsy. It’s always something with him. Always. But this year has been the worst. He blew out his back knee in May, which was kind of catastrophic for both he and I because we haven’t been hiking together since. His recovery has been complicated and slow, and I’m trying to come to grips with the fact that he’ll probably never be able to romp across hills and mountains the way he used to. (Of course, said romping is probably what destroyed his knee in the first place, but still.) If he can someday at least sniff and explore along trail-sides, I’ll consider us very lucky. Around the same time our orthopedic problems were developing, we also lost control of his epileptic seizures. Dane has grand mals and, not only was their frequency drastically increasing, they were beginning to consistently cluster in multiple events. For those who don’t know, clusters are bad because they don’t give the brain enough time to cool off in between seizures, which can lead to brain injury and even death. This was happening in spite of a drastic (and I mean drastic) increase in medication. The seizures also contributed to re-injury of his leg, and the pain levels from that were growing increasingly difficult to manage. He was losing his appetite, refusing to eat and, sometimes, even refusing to take his (many, many, many, many) meds. The situation was clearly Spiraling Out Of Control (SOOC) and it was at this point I decided to change vets. Old Doctor had been our vet for sixteen years so switching wasn’t easy. However, other than surgeries and continuing to increase the dosage of his meds, (which clearly, to me anyway, wasn’t working), Old Doctor had no other options in his tool kit. And when I asked him if he was willing to work with me in looking for other options, he told me no. I was admittedly a little nonplussed but still appreciative of his honesty. So I plunged back into the searching-for-a-new-vet world with a heavy focus on alternatives and eventually discovered our new vet, Dr. Out-There. (You want options, baby? I’ll give you OPTIONS…) This woman was a banquet…a freaking cornucopia…of other possibilities, and after walking up and down the buffet line a few times I settled on a couple of new treatments to try. You know what she suggested for his epilepsy? A homeopathic remedy. A small blue bottle of some kind of tincture with a dropper as delivery system. Now, I’m not unfamiliar with homeopathics. I’ve occasionally used them over the years on myself and the kids, with varying degrees of success. But for advanced epilepsy? Frankly, it seemed like a stretch. However, I dutifully went home and administered the required dosage (plus a little more because one or two dropperfuls just didn’t seem like nearly enough) and, lo and behold, Dane has not had a seizure for 42 days! Not one. Which has floored me. They were coming nine days apart in clusters but now? Nothing. At first, I couldn’t figure out why I hadn’t gotten one ripe tomato off of five heavily-bearing plants all summer long. Then I started finding the chewed-on but uneaten green ones he left lying around because he’d eaten so many by that point he’d actually grown picky and would only eat the red ones. (He’d turned into a connoisseur.) That was when I realized what was really going on. He wasn’t hungry for his dog food because he was engorged from grazing in the garden. Well this clearly had to stop so, after erecting a bewildering maze of barriers (which utterly failed), Dane was placed on strict house arrest with only monitored visits to the backyard. But…ha ha! Little does he know he’s dealing with a mother who nipped the picky eater tendency in the bud with her other two human children early on in their little lives. This cunning mother has a technique called hunger and, given enough time, it always, always works. I’ll admit that he’s still wining so far because I think he’s sneaking windfall apples back behind the straw bales when he’s supposed to be pooping. But it doesn’t matter. I’m patient. Unlike Dane I know that, sooner or later, this other food source will dwindle and then, my friends, he’ll be at my mercy. Oh yes. He’ll eat his dog food again. And like it. This, I promise. To close, here’s a little video of him in his better days. He can be so darn CUTE! What an incredible dog! Good that you had the foresight to look beyond the traditional. We have had very good results with homeopathic remedies for ourselves and I have heard success stories locally pertaining to animals. Thanks Jim. Y’know, I’ve worked a lot with herbs but not as much with homeopathics (other than flu remedies for the kids when they were growing up, which helped.) The results this time have just blown me away! Our other vet made it seem like epilepsy is incurable and he’ll just have to be on drugs for the rest of his life (three years and counting so far) so to have one little dropperful of homeopathic medicine stop the seizures cold is like a miracle! I’m now a convert. Your adorable, loveable robo-dog has developed a decent pallete for organic fresh grown fruit and veg is all. God knows what they put in dog food these days anyway. Faith (my cocker spaniel and permanent shadow) stole a whole packet of stem ginger biscuits yesterday and literllay ran away with them in her drooling mouth. It was too funny for me to be cross. What a beautiful blog! Wow…I’m gonna have to spend some time over there. I couldn’t find anything about her Shepherds yet though…I’ll have to keep looking. Thanks for the tip Chris. He is a beauty. I’m sure glad you discovered (hopefully/fingers crossed) a homeopathic cure for his epilepsy. I wonder if that’s been tried on people? 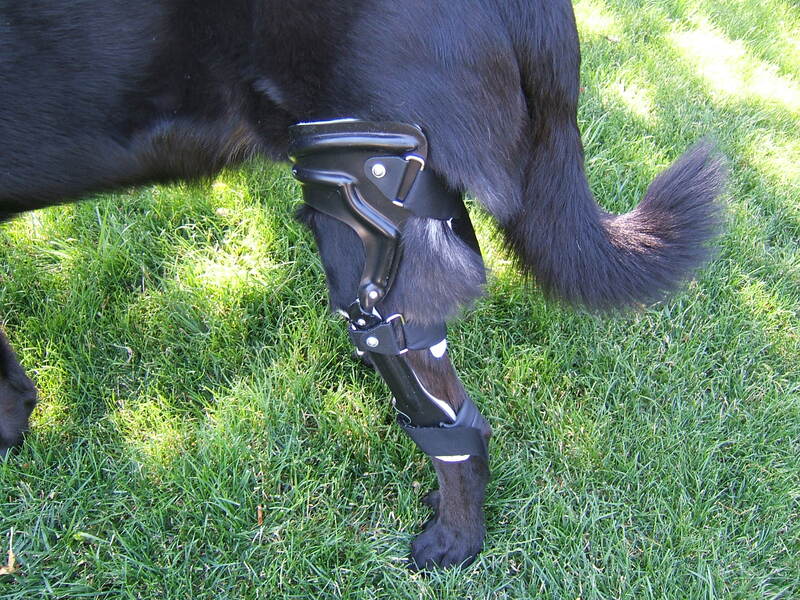 And the leg brace makes perfect sense. Now I know that’s been tried on people, why’d it take so long for dogs? It doesn’t even look as annoying as the typical plastic clown collar so often persribed to cats ‘n dogs alike. Are you being purposefully shy about plugging your new wonder vet? I’m happy with mine at the moment, but it’s always nice to have options. Tomatoes. Who’d a thunk a dog would become a ‘mater connoisseur? No! Not shy at all! Her name is Patricia Saras, DVM, and she runs the Animal Healing Center at 208.424.7755. She’s been practicing for decades I think and is really wonderful. It was a bit of an adjustment…she gives us all the time in the world during an appointment which I was NOT used to, and never pushes anything. She wants to hear what I’ve observed him doing and collaborates. And she’s suggested I go home and research some of her suggestions to be more comfortable with them! She can do all the things I traditional vet can do but prefers to try all the less invasive options first, which is right up my alley at this point. I also got sticker shock in the BEST way after our first appointment. Turns out we’ve been using possibly the most expensive vet in the valley for sixteen years and Dr. Saras is about half as expensive! I love this woman.